A Malaysian military transport plane was intercepted by two Indonesian jet fighters over Indonesia’s Natuna Islands, Malaysian defense officials confirmed Sunday. The C130 plane from the Royal Malaysian Air Force (RMAF) was traveling from Subang Airbase to Labuan, Sabah June 25 when it was intercepted by Indonesian fighter jets near Natuna Island, located in the South China Sea and separating peninsular Malaysia and the Malaysian states of Sabah and Sarawak on Borneo Island. Though no further details were publicly available immediately, a senior Malaysian official told Agence France-Presse on condition of anonymity that flying over the Natuna Islands “is a regular route” and that the C130 plane continued its journey in spite of the interception. Meanwhile, The Star, a Malaysian daily, cited a source as saying that the Indonesian jets were only notifying the aircraft that it had entered Indonesia’s airspace. “No untoward incident occurred,” he said. The incident comes during a tense period in the Natunas. 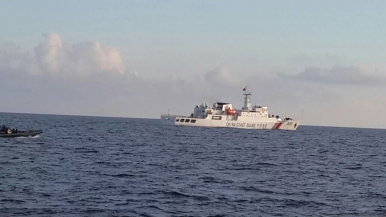 Just days earlier, Indonesian President Joko “Jokowi” Widodo had visited the islands and held a cabinet meeting on a warship in a clear signal to China following another clash with Chinese fishing vessels there. Malaysian Defense Minister Hishammuddin Hussein confirmed that the defense ministry had received information that the flight was intercepted by two Indonesian jets but said that full details of the incident were not yet available. He downplayed the incident, saying that it was “normal” and that incidents could be dealt with diplomatically, particularly given his “very close” relationship with his Indonesian counterpart Ryamizard Ryacudu. “If there were any incidents between us, we can deal with each other diplomatically. We will not let any incident ruin our ties,” he said. Malaysia and Indonesia have had their share of disputes but have both worked to resolve them diplomatically. Jakarta lost a case at the International Court of Justice over Sipadan and Ligitan back in 2002, and the two countries continue to work towards a way to address their maritime dispute in Ambalat sea block in the Celebes Sea. Meanwhile, RMAF chief General Roslan Saad said the plane is now safe and the incident will be under investigation. “The plane is safe, we are (currently) investigating and I am not able to provide any input at the moment,” Saad told Malaysian media. “In the meantime we fill fly as normal,” he added. Defense ministry statement denies claims that Indonesian fighter jets had intercepted a Malaysian C-130 plane. Indonesia Calls for South China Sea Restraint Amid US-China TensionsThe Natunas: Why Is Indonesia Developing A South China Sea Flashpoint?Indonesia, Malaysia Pledge to Solve Maritime Dispute (Again)Indonesia to Respond After South China Sea Case: MinisterWill Indonesia’s South China Sea Policy Change Amid China’s Assertiveness?